Courtney Williams has brought fire, passion and scoring to the Connecticut Sun. Chris Poss photo. 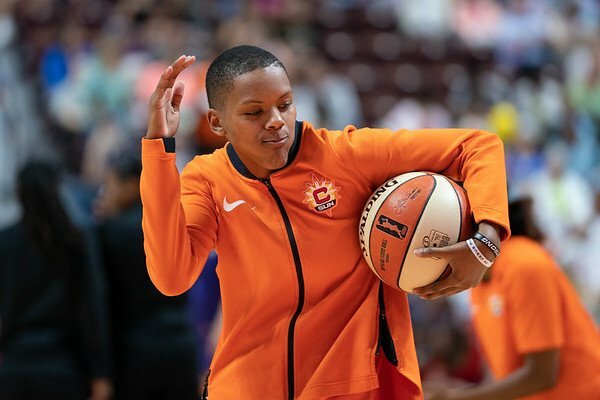 Every time 5-8 Courtney Williams flies in from nowhere to pull down a rebound at the rim, it’s easy to think of the shortest player on the Connecticut Sun roster as just a jitterbug zooming around the court. A careful look reveals one of the most dynamic and essential players on a team that has recovered its poise from a midseason lull and stormed into the playoffs. Williams’ importance to the recovering, resurgent Sun goes beyond her athleticism, or her standing as the team’s third-leading scorer and rebounder. 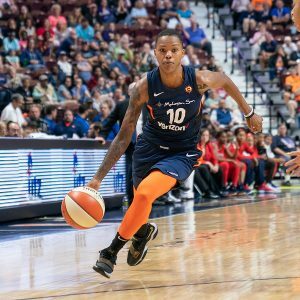 She also acts as Connecticut’s smiles leader, the class clown, the player whose quickness can cover for a defensive lapse, and a scorer who can seemingly find any opening for her signature pull-up jumper, at will. 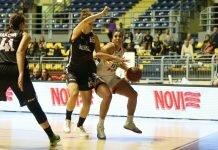 Her return from four games missed for “personal reasons” related to a physical altercation with the now-traded Alex Bentley coincided with the beginning of the Sun’s return from an extended losing streak. Williams has three double-doubles in the last 10 games, averaging 13.1 points, 6.4 rebounds, and 3.9 assists per outing – all improvements on her season average. Drafted eighth by the Phoenix Mercury in 2016, she played minimal minutes in six games before being traded to the Connecticut, where she quickly became an integral part of the rotation. She became a starter midway through last season. 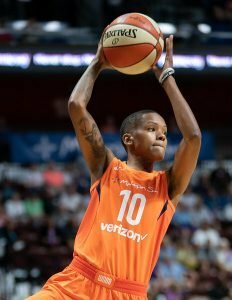 After a recent victory over the New York Liberty, Williams talked with WomensHoopsWorld about a variety of topics. 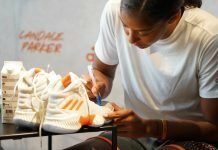 What have you learned since coming into the WNBA that you think has affected you most? I think making reads. In college it was more so running plays, but here, everybody is a great player, so you have to make reads and see what the defense is giving you. What was it like playing in Turkey over the winter? And can you talk a little bit about the friendships you developed there, with (Dream guard) Brittney Sykes and (Liberty guard) Shavonte Zellous? Oh, man, it was amazing. Turkey is very competitive, it’s a very competitive league over there and having Sykes and Z over there, it was great. They’re my homies, so we were having a good time. Oh yeah, definitely I knew them, but going over there and being with them definitely made us closer. What about being in that completely foreign environment? I mean, you’re a girl from small-town Georgia. You know, it’s always good having people that can relate to you. Having Sykes and Z over there, and a lot more Americans over there as well, was definitely a good thing for me. On this Connecticut team, who are you closest to? On this team, probably Jazz [Jasmine Thomas] and AT [Alyssa Thomas]. And Betnijah, (Laney). We played Laney, we played Rutgers when I was at USF, so I knew her. I didn’t know her personally, but I knew of her. Courtney Williams dances during pre-game warmups. Chris Poss photo. Would you consider yourself the joker of the team? Oh, yeah! I’m a clown. I’m a clown. I can be serious at times as well, but I’ve kept it loose. Is part of that you taking on that role of trying to keep everybody loose? Yeah. Definitely trying to keep everybody level-headed and let them know, yes, this is basketball and we going to be competitive, but we do what we love and get paid for it, so let’s have fun – let’s have some fun out there. Throughout your college career, you always had a smile, like you were just enjoying yourself. This isn’t one of my planned questions, but you looked tired today. I’ve probably seen you play 15 or 20 games, and I’ve never seen you tired. Oh, man. Chasing Sugar [Rodgers] off of screens and then getting out in transition, that’s like a 40-minute track meet. Do you and Coach Fernandez [of USF] still talk? Yeah. He like a Dad from afar. He just lets me know that he’s proud of me and he’s watching the games. If you could tell a young Courtney Williams something that you know now, what would you tell her? Where does you passion for the game come from, and when did it start? Well, definitely my mom and dad. They both played basketball. Didn’t you break one of your mom’s records? Oh, yeah! In high school, she held the record for most points in a game. And my dad was just athletic all around. He played every single sport. Did round-offs, back-flips. Just your all- around athlete. So I think both of them absolutely pushed me. Did you start playing basketball as a tiny tyke? Yeah, we had a little rec. league in my town, that my uncle coached. It was full of boys, but I was nice so they let me play on the team. That’s definitely where it started. And having a court outside in my yard, my dad bought us a little goal. So I’m going to exclude your parents from this question. Who, beyond them, has been most influential in your basketball career? Beyond them, I’d definitely say, Coach Wil (Bateast). So he’s – my assistant coach at USF, Coach T – he’s her husband. I talk to him every now and then, but he definitely molded my game, getting me ready for the professional level. You know, he always told me like, “you have to take it to another gear, going to that professional level. You’re not going to be able to do lots of things that you do in college, so you need to work harder.” He definitely, definitely molded my game. After hoops are done, what do you see as your next career? You mean what do I want my legacy to be? No, what will you do with your life after you’re 35 or 40? I know somebody who’s 38 and still playing the game, so . . . .I mean, I don’t know. I don’t want to think that far ahead. One day at a time. So, as long as I can play, that’s what I’ll be doing. So I don’t really think that far ahead. Now the legacy question. What do you want your legacy to be? I want to be known as one of the greats. I want to be known as one of the greats in the WNBA, the Cappie Pondexters, Diana Taurasis, Sue Birds. I want to be known as one of those guys when I’m done, when everything is said and done. What are the things you need to do to get there? Keep playing. Keep playing basketball. I think as long as I keep playing, I’ll keep producing. Stay passionate about it. What are your major interests outside of basketball? My dog. I have an American bulldog. So he’s like my baby. He definitely keeping me level-headed. He’s my responsibility, so I can’t wake up late anymore. I have to wake up early and take him out. I can’t just get up and go out, unless I have a baby sitter. You know, if I didn’t have a dog, I would just be sleeping in, loungin’ around. But now I have to be up and alert, make sure he’s not peeing around in the house. Do you have a place you think of as being “home,” even though you are traveling most of the year? Coming into this season, if there was any criticism of your overall game, it was defensively. What have you done to make that part of your game better? I think learning. Defense is all about effort, but it’s all about picking your spots, as well. You have to know where you need to be and how to position your body. And I think just hearing what my teammates are telling me and my coaches are telling me and being able to position myself properly to be able to make defensive plays. Oh, no. Of course not. I’m a jump-shooter. If you’re going to keep giving me my pull-up, I’m going to keep taking it. I don’t like to get hit, so if I can keep from getting hit, I’m going to keep from getting hit, you know? Courtney Williams prepares to pass to a teammate. Chris Poss photo. You also, when I prepared this, you were the team’s best three-point shooter, but I think. . . .
Yeah, (Shekinna Stricklen) Strick had a great night. Now I’m two. But you’ve only taken 33 of them. The pull-up is what defines you as an offensive player, but do you think about taking more threes, as accurate as you are? Man, I pick my spots on the floor, so if you going to go under screens and give me the three, then I’m going to take it. Coach Wil always told me, “make the game easy.” As you get older, you want to find the ways to make the game easy, not just use your athletic ability to make plays. You want to be able to pick your spots on the floor and be able to produce the easiest way possible. So I’m trying to do that now. So if you going to give that to me, I’m going to take it. You going to give me my pull-up, I’m going to take it. You going to give me a wide-open layup, I’m going to take it. If I can use as less effort as possible and still be able to play my game, that’s what I’m going to do. You think you’re making those reads better? Oh, yeah. I mean, basketball, I’m always learning. I’m trying to soak in everything I possibly can. I’m always learning from my coaches and my teammates, so I definitely think I’ve done better at making the reads. At USF you were the center of everybody’s defense, because you were scoring 20-plus points a game. In the WNBA that can’t be the situation. Has that affected your game? I don’t think so. At USF I just tried to play my game. Here I do the same: hit my pull-up, get out in transition, and get rebounds. I just don’t shoot the ball as much. But that’s my game, and that’s what I’m going to keep doing. You have been publicly open about your sexuality and support for LGBT rights. What made you decide to go public? ‘Cause I got a girlfriend now. I don’t ever hide who I am or who I’m with. It’s on my social media, Twitter and Facebook. I talk about whoever I’m rackin’ with. Is that a little earthy? No, just down-to-earth. At USF, were you “out” to the team? Were there any issues there or on the road? Yeah, I can definitely do that. . . . Just not now. How about with the team at USF? That was nothing at all. I was just like all of them. Back at home, some people were hard with it, but it’s cool now.